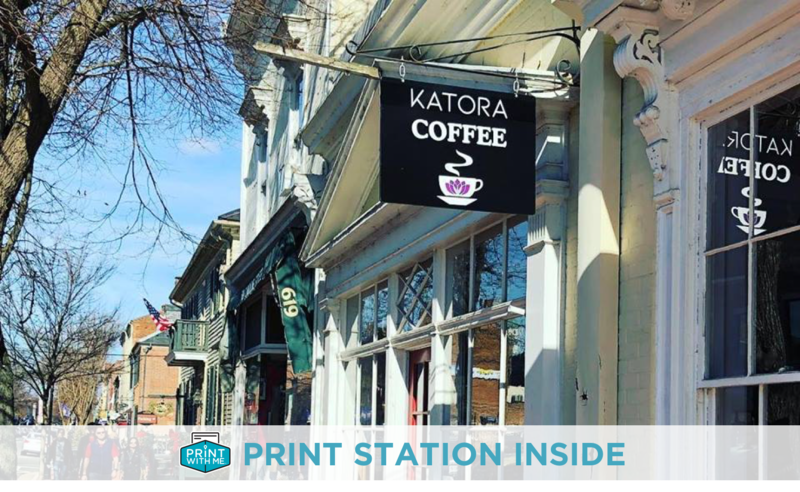 Print in black-and-white or color with the PrintWithMe print station at Katora Coffee in Fredericksburg. Once you're ready, your document will begin printing. Prices above reflect this location only and does not reflect discounts or promotions. picture_as_pdf What types of files can I print? aspect_ratio What size and quality paper do you use? We use Hammermill Premium Laser Print, 24 lb, 98 Brightness paper. We print on standard 8½"x11" size paper. note_add How can I print multiple files? You can attach multiple files to a single email, all documents will be printed when your order is completed. We recommend doing this instead of creating multiple orders. security Are my files secure and private? Yes! We encrypt all files we receive and securely delete them from our servers once they've been printed according to industry best practices. We do not scan the contents of your documents for advertising or any reason. mood_bad What if the printer is out of paper, ink, or toner? We remotely monitor the supply levels in our printers and inform on-site staff when refills are needed. However, if there happens to be an outage preventing you from printing you can ask a staff member or email our support team for quick service. photo Can I print photos? We can handle many image file formats (.jpeg .jpg .png .tiff .gif .png) but be advised our printers are not photo-quality printers and we use regular copy paper so results will vary. directions_walk Can I print remotely and pick up my documents? We strongly discourage you from pressing "Print" before you arrive. This is an unstaffed print station and you should therefore wait until you arrive to complete your print order. content_copy Can I scan, copy, or fax at this location? This location does not have scan, copy, and fax available. Those rates vary by location and will be presented at the time of purchase. computer Is there a PC or Terminal available where I can pull up and edit my document? Most locations, with the exception of a handful in New York City, do not have computer terminals available for pulling up or editing documents. Our system is meant for attached documents that you can forward from your phone or laptop, via email, to the printer. error_outline Can I bring my own paper? No. This printer can only handle its own paper supply and you will not be able to swap out paper when you arrive. invert_colors Does your printer use ink or toner? We only use laser-jet printers, which use toner. We do not support ink-jet related projects. This location is a member of the Print With Me network of printer stations in Fredericksburg, VA.